Bearhat Mountain (8,689 feet or 2,648 m) overlooks a still frozen and snow-covered Hidden Lake. 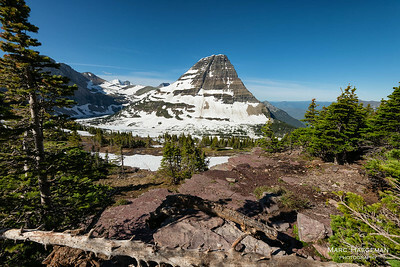 Logan Pass had only recently opened and the otherwise easy hike towards the lake resembled a small polar expedition. 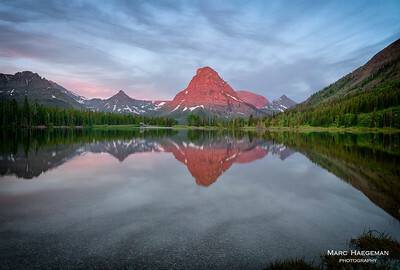 Sinopah Mountain glowing red hot in this otherwise serene morning shot of Pray Lake in the Two Medicine area of Glacier National Park. You need to see it to believe it. 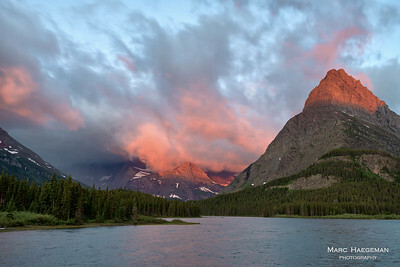 One of the iconic views of Glacier National Park in a virtuosic color display at sunrise. 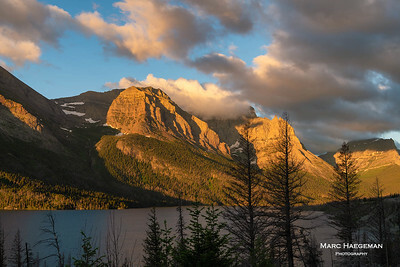 Or rather St. Mary Lake in the golden morning glow. 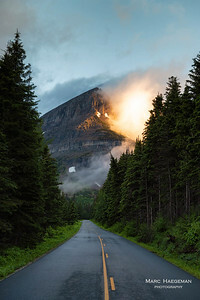 The scenic, 50 mile-long Going-to-the-Sun Road is the only road traversing Glacier National Park, east to west, crossing the Continental Divide at Logan Pass (6,646 feet or 2,026 m). A major engineering feat, it was completed in 1932. The low morning sun combined with threatening dark clouds gives this wildfire scarred area near St. Mary Lake a ghostly appearance. Beargrass wildflowers were particularly conspicuous on these scarred slopes of Glacier in the St. Mary Lake area. 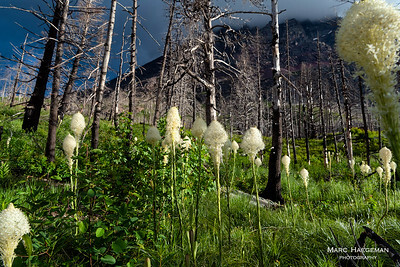 A member of the lily family rather than a grass, beargrass blooms just a few days. 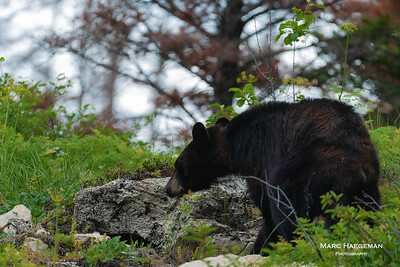 Bears usually don't eat it but love to line their dens with the plant. Every now and then, in Glacier it's not bear grass you run into, but the bear. 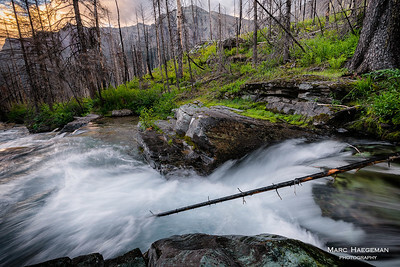 Baring Creek in Glacier National Park crashes through its riverbed in an unstoppable manner. 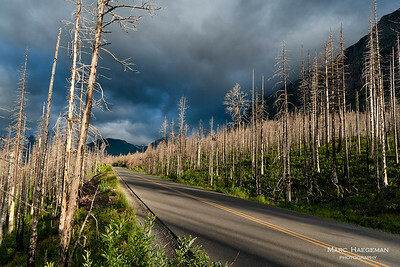 You never know what's beyond the curve in Glacier National Park. 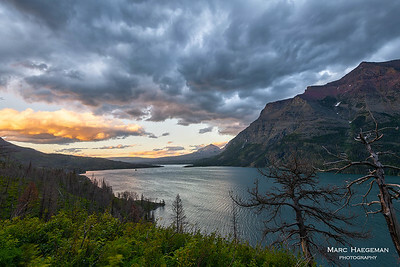 The cold and windy weather of this week in Glacier created some fantastic opportunities for photography. Who's complaining…. Preferable to any boring blue sky. The Going-to-the-Sun Road resembled more the shortest-way-to-the-clouds and if there was anything predictable about the weather this week, it was that it would be changing all the time. it really pours in Glacier. 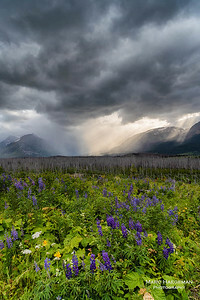 A field of wildflowers catch a bit of sunlight while the floodgates open up in the mountains. It wasn't long before I had to run for cover. 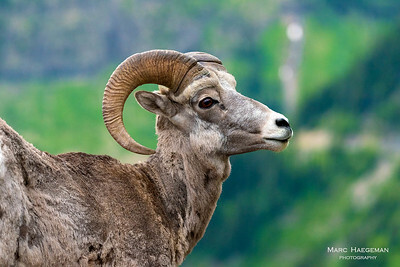 Bighorn rams are always ready to pose for a few shots along the Going-to-the-Sun road. 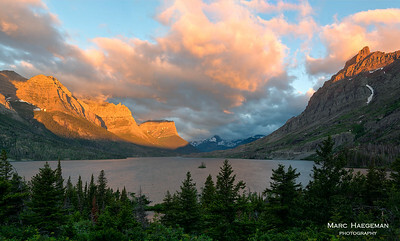 Morning on Swiftcurrent Lake, when an infernal wind seems to heaten up the clouds and the top of Mount Grinnell. 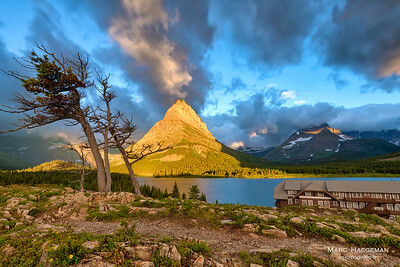 A wild play of winds and strong morning light gives Mount Grinnell on Swiftcurrent Lake a volcanic appearance. 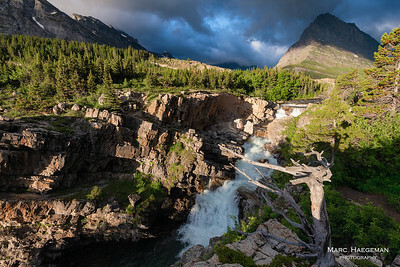 Low morning light adds to the drama of the thundering Swiftcurrent Falls in the Many Glacier area. 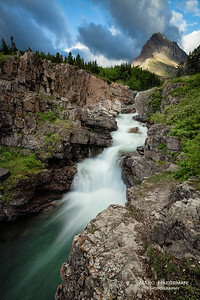 A long exposure shot of the falls topped by Mount Grinnell. 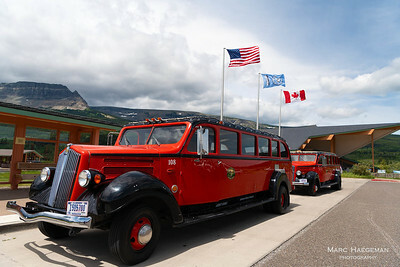 “The Rubies of the Rockies”, the iconic red buses, have been transporting people through Glacier since the 1930s. Masterminded by Roe Emery and Walter White (no relation) and constructed by the White Motor Company, the 33-strong fleet is considered to be the oldest touring fleet of vehicles anywhere in the world. The oldest buses date from 1936. Banners of the USA, the Blackfeet Nation and Canada welcome visitors. Mountains are sacred to Native American tribes. 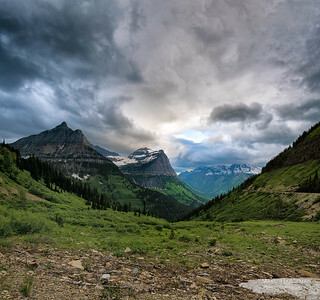 Chief Mountain is located on the border of the Glacier National Park and the Blackfeet Indian Reservation. It stands 9,085 feet (2,769 m) high. 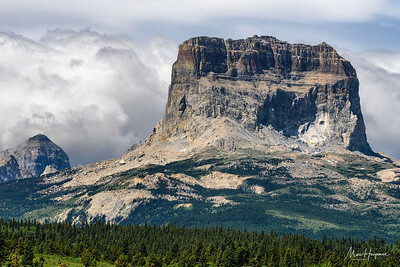 "Backbone of the world" is the Blackfeet name for the Rocky Mountains in Glacier.